The mission avionics of Japan’s fleet of four Boeing E-767 AWACS aircraft are being upgraded in a $950 million program. Faced with China’s increasingly assertive military posture, as well as a continuing ballistic missile threat from North Korea, Japan plans to spend more on defense, boosting its air and maritime forces. The plan commits to buying 28 Lockheed Martin F-35 Lightning II combat aircraft, 17 Bell-Boeing MV-22 Osprey tiltrotors, and three Northrop Grumman Global Hawk UAVs over the next five years. The Japan Air Self-Defense Force (JASDF) will also upgrade existing fleets of F-2 and F-15 fighters. The National Security Strategy that was published last December adjusts the Japanese force structure to create an amphibious brigade–promoting the plan to buy Osprey. The decision to buy F-35As was made two years ago, with a total of 42 planned for two squadrons. They will replace the JASDF’s remaining F-4Es. Japan is planning a final assembly and checkout facility for the Lightning II, although the first four aircraft will come from Lockheed Martin’s Fort Worth, Texas, production line in 2016 as part of low-rate initial production lot 8. The F-35 buy has also driven a review of Japan’s previous outright ban on arms exports. Mitsubishi is producing the wings as well as assembling the aircraft for the JASDF, and IHI is assembling the engine. Japanese industry now seems more likely to join the multinational supplier base for the aircraft. The Global Hawk high-altitude UAVs would contribute to a major upgrade of Japan’s intelligence, surveillance and reconnaissance capability. This will also include more space-based assets. The JASDF is already planning a $950 million upgrade to its unique fleet of four Boeing E-767 Awacs aircraft. The upgrade will cover the mission computer, electronic support measures, identify-friend-or-foe and cryptographic equipment. 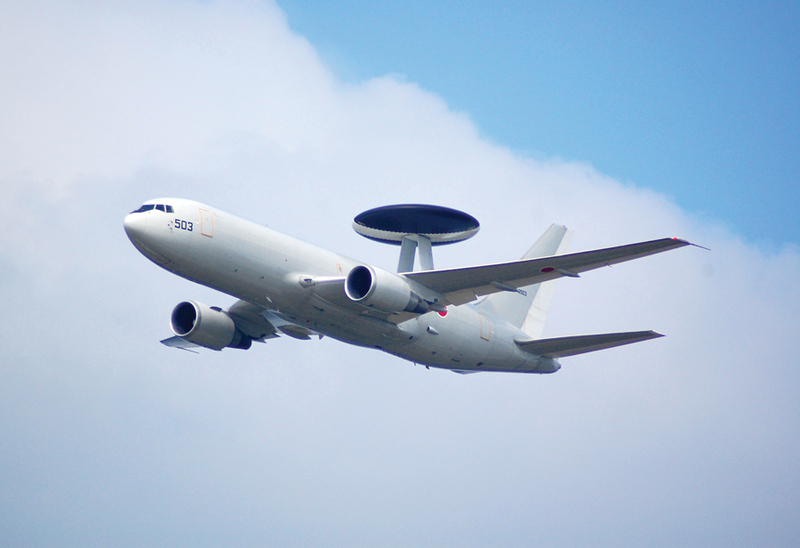 It will make the aircraft more inter-operable with the USAF’s E-3 Awacs fleet. More joint working with U.S. forces is a key aim of the new security strategy. As tensions with China and Russia have risen, the number of interceptions performed annually by the JASDF has risen to over 500, compared with 100 to 200 in earlier years. So the service’s combat aircraft fleet will be increased by 20 to 360 in 13 squadrons. A second air refueling squadron will be formed–the first operates four Boeing KC-767s. The JASDF is upgrading at least the newer F-15s in its 150-strong fleet to an F-15MJ configuration with new datalinks and m-scan radar. The F-2s will receive a radar upgrade. With Lockheed Martin, Mitsubishi co-developed the F-16 into the F-2 with a 25-percent-bigger wing and passive e-scan radar, to meet Japan’s maritime fighter interdiction requirement for longer range. The last of 94 aircraft were delivered from the Mitsubishi production line in 2011, but 18 were badly damaged at Matsushima airbase by the tsunami that hit Japan in March 2011. According to Col Koji Imaki from JASDF headquarters, the F-2 program contributed greatly to the building of Japan’s aerospace industrial base, although the unit cost was a high $120 million. That industrial capability has been proven twice now in response to unusual events, he said. In 2007, the entire Japanese F-15 fleet was inspected in just 18 days after the nose-break incident in the U.S. Last year, Mitsubishi and partners assessed that 13 of the 18 damaged F-2s could be repaired. Moreover, he added, industry programs have kept the JASDF’s F-4 Phantoms flying, and improved the fleet’s declining mission-capable rate. They include a corrosion inspection and remedial regime.